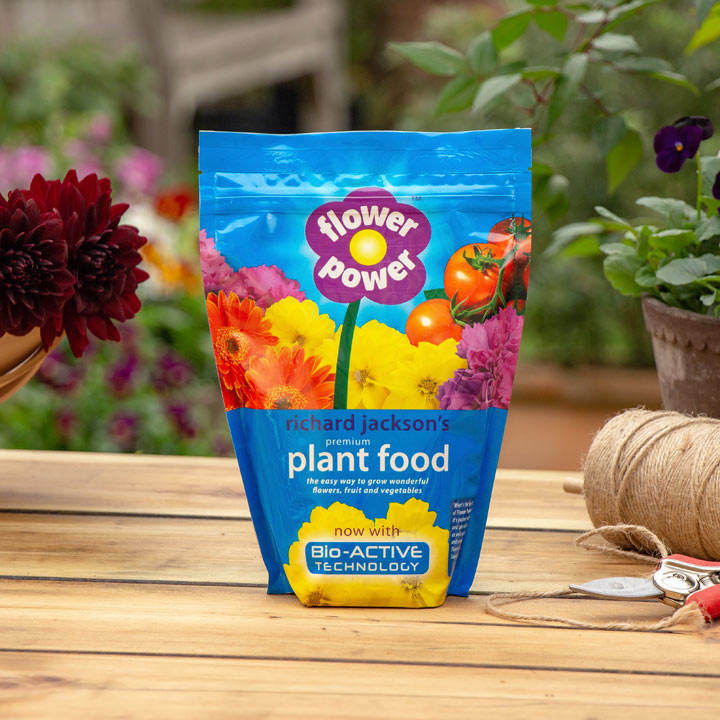 Flower Power Premium Plant Food part of the Richard Jackson Flower Power Range - The professional high potash formula to help you grow more flowers, fruits and vegetables. Flower Power is one of the best kept secrets in gardening. Those gardeners who know about it, love it, and they've made it one of the top selling plant foods in the UK. The 475g pack makes 427 litres (95 watering cans) of feed, while the 900g pack makes 810 litres (180 watering cans). N-P-K 12-12-36. Flower Power fed plants have won over 80 gold medals and first prizes at major flower shows, including RHS Chelsea, for plants including clematis, fuchsias, begonias, roses, aubergines, geraniums, sweet peas. Dahlias and potatoes. Trusted by thousands of gardeners to help them grow more flowers, fruits and vegetables than ordinary plant foods. The extra high levels of potash in Flower Power also help to improve the flavour of fruits and vegetables, make plants more resilient to pests and poor weather, and builds their winter hardiness. Use Flower Power on ALL plants, indoors and out. You don’t need to buy other specialist feeds for plants like roses, orchids, tomatoes, azaleas…Flower Power gets great results with them all! Super concentrated Flower Power goes much further than ordinary plant foods. Just add 5g to 4.5 litres / 1 gallon of water.